Introducing a new type of insulation foil for radiators. This foil can be installed at the rear of the radiator. Through its high heat reflecting performance, the foil reflects the warmth back into the room and prevents the heat going back into the wall. No need for glue, paste or removal of the radiator – this is the quickest and simplest system available today. 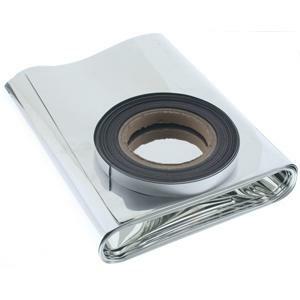 This Insulation Foil for radiators comes with 10 metres of self-adhesive magnetic tape for easy installation behind the radiator. Simply cut the tear proof foil to suit the radiator size, and place the magnetic tape on the surroundings of the foil with the self-adhesive side of the magnetic tape. Now you can easily take this and place it behind the radiator; corrections can be easily made by sliding the foil at the rear side. The magnetic tape allows corrections but is also strong enough to retain the position once aligned. If you want to clean or remove, simply take the foil off, clean and then replace again. By using magnetic fixings removal and reposition is very easy. Buying this product will earn 150 Loyalty Points. Be the first to submit a review for the Magnetic Radiator Insulation Foil.